Champion Arlek is one of the 16 named mobs in the froglok forager cycle. This page last modified 2017-11-24 11:44:15. When I saw him the club was visible. I didn't kill him, but tried to pull him. The guy that did kill him was in my guild though so he let me have the club. Not a bad item at all 8/24 +3 wisdom. Myself (a lvl 51 Enc) and my Dru friend (47th) encountered this freak of nature to the right of the SoNH tunnel, wandering near the stream. Took us a while but with fear kiteing it. We didn't have to move around too much (fear didn't hold that long, and it was actually a blessing that it didn't). And it went down in the end. I, OOM and Dru about 30% (I can't remember what we went in to the fight with though. Just expect to waste alot of mana if you are solo or duo) . Freakish amount of HP. Say in the 6k+ region. Kinda like fighting the Spurbone Champion in Dreads. Dropped the Knobbed War Club. 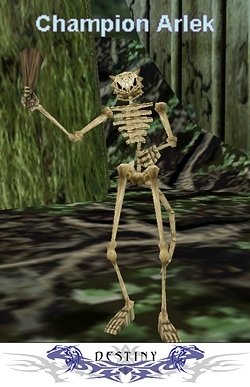 Looks like any other iksar skeleton and the weapon wasn't visible on him.